We will escape the crowds of the resort, explore remote valleys and have a proper adventure on two wheels in the midst of an alpine winter. From €400 per person (bed and breakfast) and from €300 per person (self-catered). 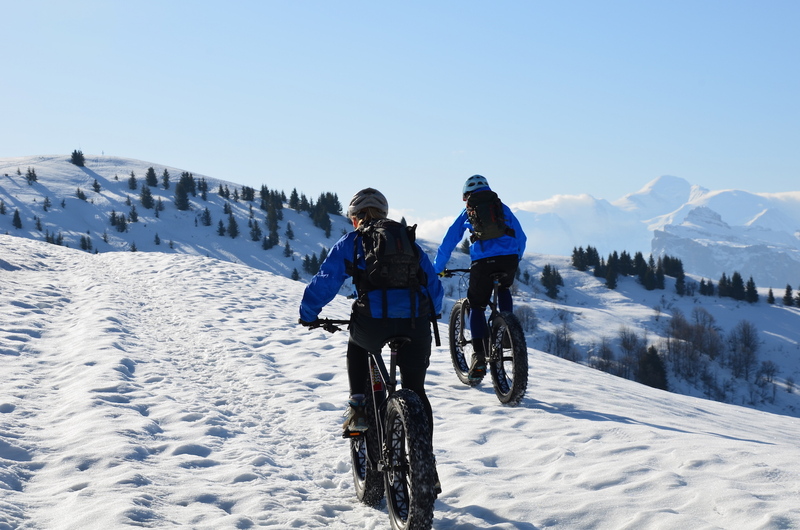 2 days of guiding with three nights half board accommodation (dinner, bed and breakfast and afternoon tea), fat bike hire, airport transfers from and back to Geneva and some van support. 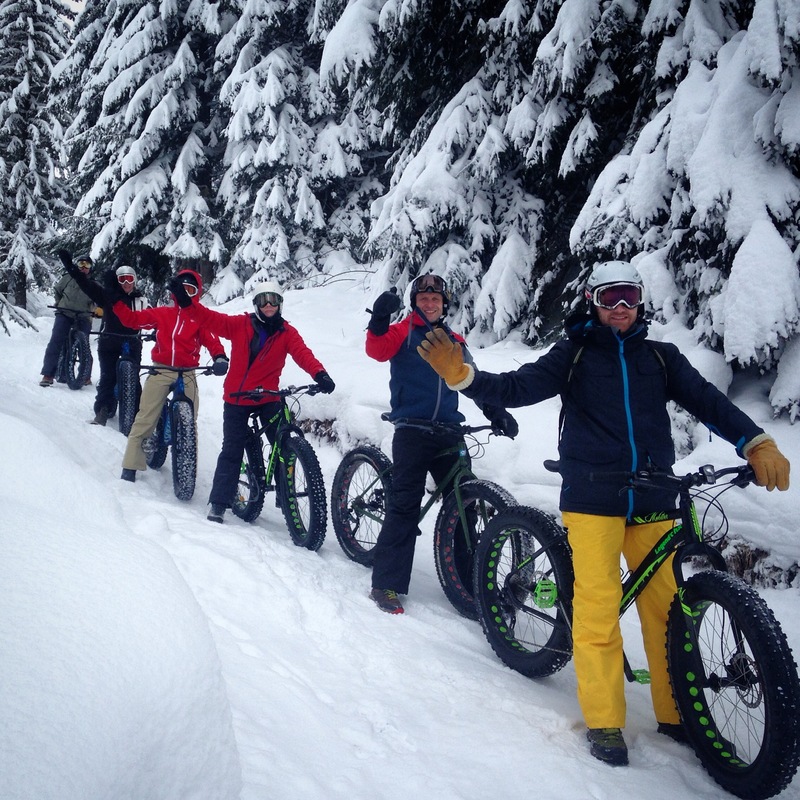 Two days of pioneering winter mountain biking on Fat Bikes. It’s the latest form of winter back-country travel and you’re going to love it! Prices from €400 p.p (bed and breakfast) and €300 p.p (self-catered) for a long weekend or mid-week break. Email us for a quote specific to your group size and needs. For experienced mountain bikers we can offer exhilarating enduro loops and epic adventurous descents. For novice bikers we can use the pisted riverside trails. If you are interested in longer fat biking trips contact us directly. 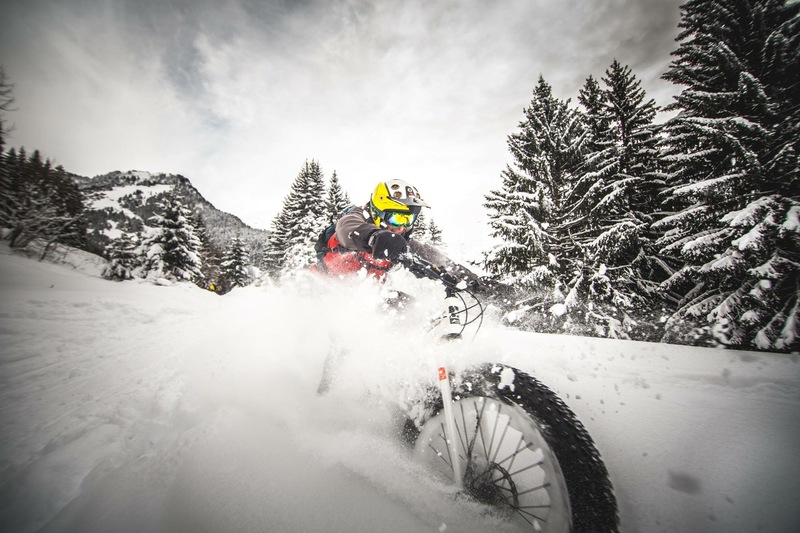 Fat bikes are bikes with extra fat, knobbly tyres designed for riding on snow. They usually have a simple mountain bike design. The super fat tyres distribute the rider’s mass across a larger area, gaining more traction than with a standard tyre size. You can ride easily and with stability over snow and ice. If you are interested in longer fat biking trips contact us directly. The catered package includes two days of guiding with three nights bed and breakafst accommodation in a small hotel, fat bike hire, airport transfers from and back to Geneva and some van support. Email us for more information. 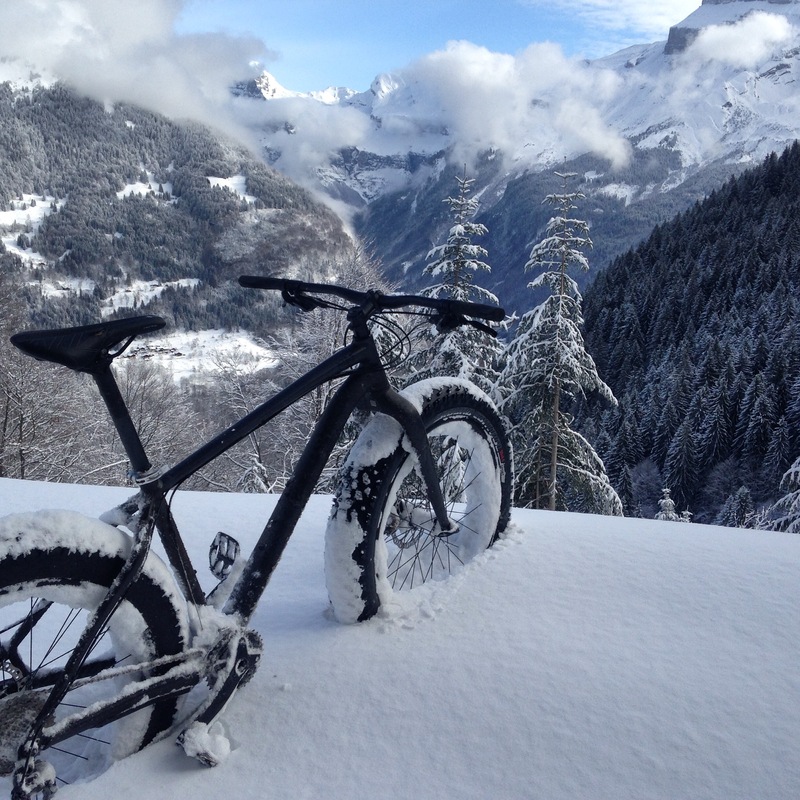 The self-catering package includes two days of guiding, three nights in a self-catering apartment that sleeps up to 6 people, fat bike hire, airport transfers from and back to Geneva and some van support. Email us for more information. In the winter season: from first snow at the end of November (this varies from year to year) up to the end of April. Fly or take the train to Geneva airport and we will arrange collect you and take you to your accommodation in Samoens or Morillon village. Or you can drive direct. How hard is it going to be? We aren’t allowed to use the ski lifts and pistes (although there may be the option of a cheeky ride down the piste at the end of a day!) so most of the climbing has to be done by pedal power and in the van. It takes slightly more energy to pedal a fat bike on the snow than a standard mountain bike on dirt but we don’t cover as much distance or height gain as we do in the summer. We probably won’t do more than 750m of ascent in a day. We can get in more descent by using the van. The standard itinerary is suitable for all mountain bikers that are reasonably fit and ride regularly. We can adjust the itinerary to suit novice riders in a private group. Email us for more information. You will stay at La Reposette in Vercland, Samoens. 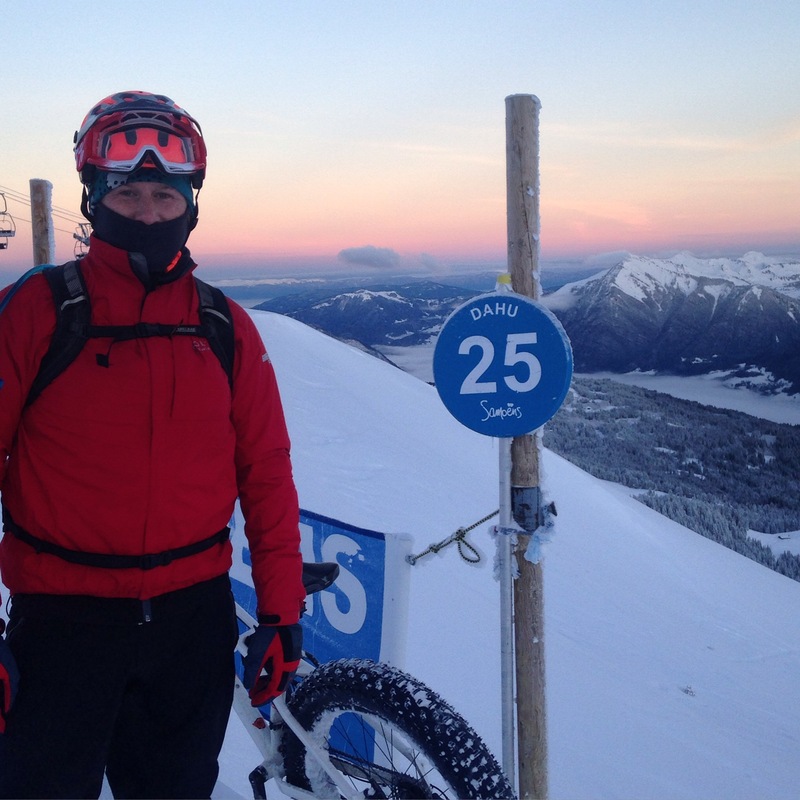 It’s one of our favourite places to go for après ski/bike/snowshoe or out for an evening meal. There’s a lovely relaxed atmosphere and the rooms look great. They only do B&B but you can eat there in the evenings and choose from the menu a la carte. It’s not expensive but the food is good quality. We can also run this trip on a self catering basis, using our own holiday apartment. Email us for more details. If you prefer, you can call us 7 days a week between 8am to 8pm on +33(0)450 559248. For information on how to book, or to make an enquiry, please see our how to book guide.